Health claims can be made in advertising only if a statement indicating the importance of a varied and balanced diet (and a healthy lifestyle) is included, according to EC Regulation 1924/2006. Of course, a possibility – when TV commercials are concerned – is to add on-screen text. Increasingly, however, this is at least complemented by showing a balanced meal, generally a breakfast with fruit, juice, milk and, for example, toast. It is a visual statement to the same effect. Though we have seen little use of this approach in the food supplement sector, it is certainly interesting. Recently, UK’s ASA (the Advertising Standards Authority) has upheld a complaintagainst Danone’s Nutricia ad. While the Authority agreed that Nutricia could not compare their product, Cow & Gate Growing Up Milk, to other categories of food, it noted “the relevant EC Regulation [Reg. 1924/2006] did not prevent a child being depicted drinking Cow & Gate Growing Up Milk as an accompaniment to a meal, to clearly illustrate the importance of a varied mixed diet in which the product might be one element“. At the same time, a compaint has not been upheld against Ferrero’s Nutella saying on the importance of a varied diet statement: “the ad showed each child eating only one slice of toast with Nutella and that the images also included other breakfast items such as fruit juice, milk and cereal”. A recent example, in this respect, can be viewed in Italy with Danone’ Danaos ad which, regardless of other comments, shows a balanced breakfast, with juice being poured, etc. The Annual Meet ing of the Society for Risk Analysis Europe took place this year, for its 20th edition, in Stuttgart (Germany) from 6th to 8th of June and I have had the chance to attend the conference, contributing with an oral presentation within one of the symposia organised. More specifically, I have given a presentation within the symposium “Food Risks and Benefits” which was focused on the results achieved so far by FoodRisc project (for more information visit www.foodrisc.org). FoodRisC is an FP7 funded project, currently running, focused on food risk and benefit communication and Hylobates Consulting is one of the partners of the projects consortium. Many topics were covered during the oral sessions and symposia running in parallel throughout the whole conference. The most interesting ones, bearing in mind the work we carry on at Hylobates, were risk assessment, risk management and risk communication in different fields, such as food, nanotechnologies, climate change, nuclear power as so on. In particular, risk communication was of interest for us considering our involvement in FoodRisC project as already mentioned. In relation to the issue of perception of risk communication, Ellen Peters (Ohio State University, US) explained in her presentation, during the first plenary session of the conference, the concept of “numeracy” and its implications in risk perception. “Numeracy” refers to the ability of individuals in processing numeric information contained in a message. This skill influences decisions people take about various kinds of risks, such as environmental, health or financial ones, when exposed to information on related issues. Moving on to risk assessment and risk management, two presentations were dedicated to this complex topics followed by a lively debate between the speakers. The first presentation was from Terje Aven (University of Stavanger, Norway) who focused on the misconceptions of risk which are present in the methods used in risk assessment and risk management. The speaker provided some examples as well as some ideas for improvement. 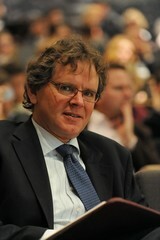 Subsequently, Charles Vlek (University of Groningen, Netherlands) gave a talk on uncertainty in risk evaluation and on the rational balancing the precaution and venture principles, using different examples to explain the theory behind these principles, from the Trojan horse to E.coli crisis in Germany. Finally, I would like to mention the presentation of Atsuo Kishimoto (National Institute of Advanced Industrial Science and Technology, Japan) who provided a thorough explanation of the risk governance in a multiple risk situation such as the one that occurred in Japan on last March, with the earthquake, the tsunami and Fukushima nuclear accident all at the same time. The speaker talked about the consequences of the unexpected height of the tsunami and complete loss of electricity in the nuclear power plant at Fukushima in relation to what were considered to be the deficits of the managing system emergency. Hylob ates Consulting is working on the development of a risk/benefit assessment of plant food supplements (PFS) together with the National Institute for Health and Welfare of Kuopio (Finland), as partners of PlantLIBRA EU funded project (for more information visit http://www.plantlibra.eu). 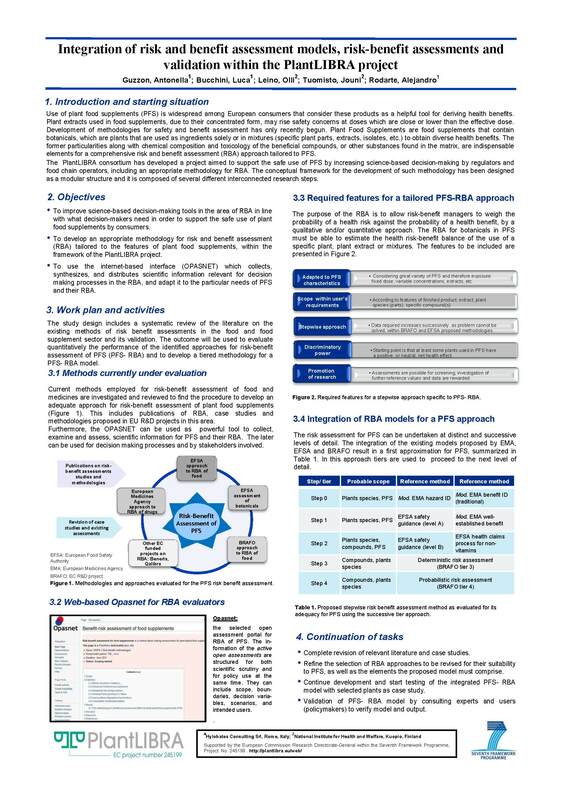 Preliminary results on the work done so far were presented at the poster session of the 20th Meeting of the Society for Risk Analysis Europe, which was held in Stuttgart (Germany) on June, 6th -8th. The model under development will be the result of the integration of existing models for risk/benefit assessments used in other sectors and for other products, such as food and drugs. To achieve this purpose, literature on methods currently in use, such as the one provided by the European Food Safety Agency for risk/benefit assessment of food or methods proposed by the European Medicine Agency for drugs, is being revised by researchers at Hylobates Consulting. Of course the final model will have to meet the various features of plant food supplements and will have to be adaptable to the characteristics of the finished product for which the assessment is required (extract, plant species, specific compounds). This represent the challenge which researchers are currently facing in the integration of risk/benefit approaches currently existing. The National Institute for Health and Welfare of Kuopio (Finland) is at the same time working on developing an open assessment for risk/benefit of plant food supplements through a Wiki-platform named Opasnet. By this way, the approach developed will be freely accessible both for scientific scrutiny and policy use at the same time. During a conference in Lille, Renger Witkamp, Professor of Nutrition and Pharmacology at Wageningen University in the Netherlands, and PlantLIBRA’s Scientific Advisory Board vice-chair, has lately given an interesting interview on the hot topic of the convergence of food and pharmaceuticals. The Scientific Advisory Board provides advice on the progress of the PlantLIBRA EC project and helps ensure that the PlantLIBRA’s output is of the highest scientific quality. Hylobates provides the secretariat to the Board. The interview can be found on the daily online news on the website NutraIngredients.com.